For those who have been paying attention, Major League Soccer has changed quite a bit in the past few years. Not just as far as the on-field product or how many teams play in their own stadium, but as an overall entity. One of the biggest reasons for that is the revolution the league has seen in their methods of reaching out to fans. Digital mediums are now utilized in fantastic fashion in order to bring fans into the league that might otherwise have been left out. Five years ago, it was extremely difficult to watch an MLS match if you didn’t pay your cable company an exorborant fee, and what if you missed it? DVR was not yet commonplace. MLS realized that they were missing out on an huge piece of their potential market. They also realized that they were doing a disservice to the fans who were in place and wanted to watch but were in a market out of touch. Enter MLS Digital in 2009. MLS Reserves: In simple terms, what is the overall purpose of MLS Digital? Chris Schlossler: "To create the ultimate digital experiences for North American soccer fans with access to the best content across multiple properties and devices." MLS Reserves: How has MLS Digital changed over the years, the past five in particular, in order to accommodate the growing number of teams and social mediums available to fans? Schlossler: "MLS Digital was founded in the fall of 2009, over the past two years we have experienced tremendous growth. During that time the size of our team has roughly doubled and with the launch of Kick will likely grow significantly in 2012. The interesting thing is that when MLS Digital was founded it really was founded to create a new website for MLS. In the last 2 years the growth of Social and Mobile has been unbelievable to a point where we think about creating great content, and then creating awesome ways for fans to consume that content online, mobile, social and through our network of partners." "The launch of Kick also provides an additional opportunity to expand our content beyond just MLS and soccer in the United States to a more global focus. Overtime Kick will become our international brand while MLSsoccer remains true to providing the best coverage of MLS and soccer from a North American perspective." MLS Reserves: To the outsider it has seemed that major networks (ESPN, FOX) were either slow or unable to provide coverage of a majority of games for the league. From that perspective fans were missing out on a great deal that the league had to over. MLS Live and its predecessor Matchday Live seemingly stepped in to fill that gap. Have you noticed this as a successful endeavor? Schlosser: "We are very excited about the launch of MLS Live, we want to provide fans access to as many games as possible on as many devices as we can. With 3 national TV games a week we are now at a point where 6-10 games are not on national TV, this provides a great opportunity for MLS Digital to provide coverage for fans who want to watch MLS." MLS Reserves: What sort of feedback did MLS Digital receive about the Matchday Live experience that they put into action when creating MLS Live. How are the two different? Schlosser: "We are constantly looking for ways to innovate and improve our products, part of that comes from feedback we receive via email, twitter and our annual customer satisfaction surveys. The most important feature of MLS Live is the ability for fans to watch a game with a great HD stream on a growing variety of devices. This year one of the big changes is that we are switching to Flash from Silverlight. While Silverlight can provide top of the line streaming quality we felt like we would have a better opportunity to deliver a top quality product in conjunction with our Live streaming partner Neulion if we switched to Flash. This decision was driven by feedback we received from fans, as well as Neulion's expertise with the Flash platform." MLS Reserves: What sort of network demands are put into place by the league or even server limitations that MLS Digital has had to work around in order to provide fans with the best experience possible? Schlosser: "I think the biggest limitation from a fans perspective is probably the national and local blackouts that we enforce on MLS Live. We hear often from fans who request that we remove these blackouts. While I certainly understand that fans want to watch their favorite team on the service we also live in a world where national and local broadcasters are paying ever increasing rights fee's to MLS for the right to broadcast and stream MLS matches." "Many of those contracts require that we blackout games on our streaming service either nationwide or in a local area. In the cases where we are blacking out a game, that game should always be available to fans via TV networks that are broadcasting in that particular Zipcode. Our blackout policy is very similar to the policy followed by MLB, NHL and the NBA." MLS Reserves: Currently, what mediums/platforms are you able to reach with MLS Live and the MLS Matchday Application? Schlosser: "MLS Live will be available on your computer, iPhone, iPad, Roku and Panasonic TV's. Ahead of First Kick we will be launching all new versions of the MLS iPhone, iPad and Android applications. Additionally, we are working to relaunch our Windows Phone Application later this spring. The 2012 iPhone and iPad applications will both feature Apple AirPlay allowing fans who have an AppleTV to watch MLS games on the big screen." MLS Reserves: Obviously there are challenges in reaching multiple platforms with your content, IOS and Android in particular. What challenges have you faced and are you facing in order to reach as many fans as possible? Schlosser: "This is such an exciting area that is changing so fast, our biggest challenge is staying current on all of the various platforms and devices that are available to consumers today. We work very closely with most of the top technology and platform companies to ensure that we are providing great experiences for our fans. Fans should know that we are always looking at the latest releases to figure out how we can use any new features to create cool experiences for fans." MLS Reserves: Should fans have feedback, what is the best way to go about sending this to the MLS Digital team? Schlosser: "Email Feedback@mlssoccer.com, tweet @MLS or reach out to any one of us individually. We love to hear feedback as we are constantly working to make improvements and launch new features and products." 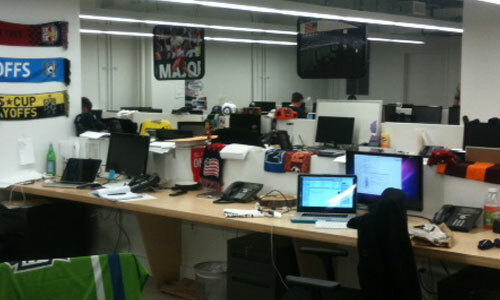 MLS Reserves: What is the MLS Digital team most proud of in their work? Schlosser: "We are very proud of all we have accomplished thus far; building the best soccer content team in North America, providing fans with great digital experiences on a variety of platforms, providing real time customer service via Twitter and Email but we also know that we have an enormous opportunity in front of us to continue driving innovation and new products for our fans." "We wake up every day thinking about what else we can build, cover, or innovate around and will not sleep until soccer is considerably larger than it is today. MLS and soccer will continue to grow rapidly in this country and we know that digital experiences will drive a large portion of this growth. We couldn't be more excited about the opportunity in front of us." 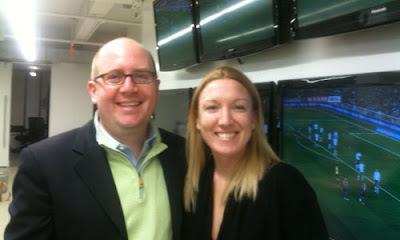 Schlosser and Amanda Vandervort, working hard for MLS fans. MLS Reserves: Lastly, is there anything that you'd like fans of the league to know that perhaps I have not covered. Upcoming projects, feedback you need from them? Schlosser: "We always want to hear from fans, please email or tweet us with any ideas, comments, thoughts, etc. We are also always looking for great new team members, right now we have a number of open positions on the Digital team and are always interested in meeting passionate, talented individuals who want to make a difference."